More than 10 million people worldwide have seen Disneys latest animated film, Cars. 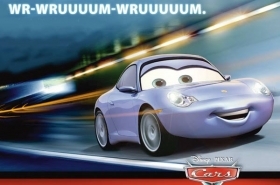 One of the films stars is Sally Carrera, a blue, female Porsche 911. MUNICH - Porsche is reaching a new set of potential fans. Thanks to Sally Carrera, the animated Porsche 911 that stars in the new Disney/Pixar movie Cars, the German sports car maker is being seen by millions of potential car buyers worldwide. Such exposure would easily cost a company tens of millions of euros. But for Porsche, the advertising is free. This is particularly helpful to the brand in the US, where the company sold 35 percent of it 91,219 global volume but spent only an estimated $20.7 million (about 16.3 million) on measured media last year. By comparison, General Motors spent about $2.8 billion in the US. Cars, an animated movie starring only car models, has been a summer hit. Through September 10, the film has made $425.4 million worldwide. The movie debuted in the US June 9 and started to reach European theaters in July. It opened in Germany on September 7. The movie tells the story of a famous racecar driver who gets lost and ends up in the sleepy, fictional US town of Radiator Springs, along the famous Route 66. There he meets Sally, a 2002 Porsche, who is the towns lawyer. Sally and other town residents teach the hot-shot driver that friendship is more important than fame and money. The German carmaker liked the storyline, says Bernd Harling, spokesman for Porsche Cars North America. Porsche, which once only targeted young, rich men, now wants to broaden its consumer base to families and moms. About 30 million people have seen the movie in the US, which is an exposure that even Porsche does not snuff at, Harling says. Our clientele has expanded because of the Cayenne SUV. With the Cayenne, were not just targeting the 47-year-old affluent architect or lawyer. This is a four-door SUV that were targeting to families, moms who make decisions and kids sitting in the backseat. Harling says no money changed hands between the carmaker and the moviemaker. The directors of the movie approached Porsche headquarters in Stuttgart for the permission to use the Carrera name and its image, he said. Harling said Porsche agreed, knowing it would be a good marketing idea. But Porsche bosses also were pleased that the films executives understood the car company. For Porsches part, it provided the filmmakers with an actual 911 so that they could develop the Sally character based on the real characteristics of the car. On the marketing side, Porsche dealers in the US gave movie tickets to consumers who test drove a Porsche. The company also provided a real 911, which was custom made into a life-sized version of Sally Carrera. The car toured about 40 US cities. Matching its marketing success in the US will be difficult. Harling says General Motors has exclusive automotive marketing rights to the movie here. Harling says Porsche North America may do a direct marketing campaign in the US when the DVD version of the movie is released November 7. He says the company is discussing the possibilities of such a campaign with Disneys distribution arm, Buena Vista.